Ever played a game that make you seat at the edge of your chair?Well, now you have one that gives you that special feeling of anachiever with over +2000 Bubble Shooter classic levels and brainracking puzzles to solve. --> Free download for android mobileand tablet devices. --> Match three balls of same color to makethem burst. --> Bubble pop and earn great points. --> It’snot all about bouncing balls but solving puzzles and catching fun.--> Enjoy constant updates with newly introduced puzzles. -->Captivating pictures and visuals like never before. --> Bubbleblast your way to victory and explore more exciting classic arcadelevels. --> No internet connection needed. --> Acceptable andno game lagging on all android devices. Rate before it's to late! Maximum pleasure and totally free bubbleshooter game in landscape mode!DESCRIPTION- Classic original game play.- Win by eliminating all bubbles of the screen.- Highly addicting-play-for-hours game.- FREE bubble shooter game with unlimited lives.- Intuitive game mode.- Relaxing and satisfying game type.ABOUT- Bubble shooter is a very popular and fun game played around theworld by million of players of all ages.- If you never played this game before don't worry it's very easyto get started.- Connect 3 or more bubbles of the same shade and win the game byclearing all the bubbles.- TIP! The main skill you will have to master to win this game isaiming thoughtfully.FEELING LIKE A BUBBLE MASTER?Like us on Facebookhttps://www.facebook.com/classicbubbleshooterFollow us on Twitterhttps://twitter.com/C_BubbleShooterTHIS GAME BROUGHT TO YOU FREE!! !IF YOU LOVE IT, PLEASE SHOW YOUR SUPPORT BY RATING..
Game Modes: Classic, Arcade, PuzzleExperience a new kind of fun when you download and play thenewversion of Bubble Shooter Puzzle with newly updated levelsover2000 levels. You can get the game for Android for free onGooglePlay store.Why You Must Download It?• Easy to learn and fun to play• Free online access• Create the feeling of a warrior in you when you bubble blastyourway through the levels• No age limit• Captivating game effects and animationsLet’s Get Started:• Drag Your Finger Across to Aim!• Release to Make A shoot• TIP: To bubble hit accurately, use the aim- line to bounce offthewall with more force and reach higher places• Connect 3 or More Bubbles for Pop!• Bubble Blast your way to victory• Solve all Bubble Shooter Puzzle and finish the gamewithease.Ball Shooting Game Benefit:• Enjoy special moment with your loved ones• Improve your learning abilities• Build self- confidence and decision skills• Play anytime and anywhere since you can play it onmobiledevices• Turn your relaxation moments to fun moments.To encourage us provide you with more exciting games,DOWNLOAD,PLAY, AND RATE US 5 STARS! Enjoy playing one of the most popular gamesfor FREE!HOW TO PLAY?- Make bubbles pop by getting 3 or more bubble of the same colormatch.- Clear all the bubbles to win levels.- Use the side borders to make angel shots.MORE BUBBLE SHOOTER FUN!- Addictive puzzle levels to solve.- Arcade game mode, don't let the bubbles hit the bottom!- Try to pop large bubble groups to advance levels faster. Download and play the Classic and most addictive Bubble Shooter ™game on Google Play - for FREE! Enjoy the top bubble breaker onlinegame and solve all the awesome puzzles. We have designed this funshooter game for all you puzzle fans who want to train your brain,matching colors and popping bubbles. Get the app NOW, beat levelsand enjoy this addicting and relaxing bubble pop game! Play 3 GameModes: * Enjoy Puzzle Mode with over 1800 awesome puzzle levelsClear the board and advance along the map, win amazing rewards andenjoy fun new elements and features. New boosts, power-ups, dailyrewards, cool bubble elements, and more! * Play the Levels Modewith over 1750 levels! Match 3 bubbles or more to blast and winwith less shots to get more stars. * Enjoy the Classic mode -Simple and Super Fun. Classic mode has 3 Difficulty levels- easy,medium and hard. It will keep you challenged for many hours! GameFeatures: • 3 Fun Game Modes • Addicting gameplay, once you start –you simply can’t stop playing. • Colorblind mode • Leaderboard,Challenging achievements. • Awesome rewards and cool puzzles •Exciting features and elements • Choose your aiming method betweenLaser, Crosshair or simply Tapping on the screen • Remove adsoption (In-app purchases) • Free to play bubble game How to Play: *Drag your finger to move the laser sight in the direction of thebubbles. * Lift your finger to take a shot. * Match 3 bubbles ormore of the same color to pop the combo and win points. * Hit andpop all the colored balls to clear levels. Bubble Shooter ™ is thebest online puzzle game you can play anytime and anywhere, nointernet connection is required. Download today, match 3 colors,hit balls and win. Beat all the challenges and overcome obstacles.Join the bubble popping fun now! Warning: This classic game isseriously fun and super addictive! Personal Note: We are all aboutmaking games that are fun for our users and your ratings will allowus to keep doing that. If you like Bubble Shooter ™ and you enjoyplaying it please find your time to rate it! Thanks :) Make sure tokeep an eye out for cool updates and new levels! Follow us fornews, updates and fun surprises: Visit our Facebook page:https://www.facebook.com/BubbleShooterFree/ Go to our Youtubechannel: https://goo.gl/Gd8qiJ All rights of Bubble Shooter™ areowned by Ilyon Dynamics Ltd. Bubble Shooter is the most classic and new bubble shoot games 2017.This free version is the only one that contains Puzzle Mode, ArcadeMode.With 1000+ puzzle levels you will never get bored with thisgame.How to Play:1.Tap where you want to shoot bubble2.To group 3or more bubbles to make them bust3.Clear all the bubbles on thescreen to level up,and try to get 3 stars on each level.Tips:Breaking the bubbles continuously can get points asbonus!Features:1. Puzzle Mode - 1000+ fun levels of saga puzzles2.Arcade Mode - The bubbles will go down gradually so you need toshoot quickly to avoid deathBubble Shooters games free has 1000+levels to play, and more free, fun and addictive levels will beadded to this bubble shooter free download game!Deluxe HD graphicssuitable for kids, toddlers.You can continue your game to make surethat you don’t lose any progress. So just sit back, relax andalongside those colorful bubbles. Play the classic and most addictive bubble pop game for FREE, match3 colors and clear levels. Don’t miss out this fun relaxing game!In this good old version you need to aim & shoot, to drop &burst all bubbles. Train your brain with this original puzzle asyou blast balls online or offline - anytime! Bubble Shooter™ is thebest FREE app available on Google Play. Ready to start the action?Aim, match and smash all the balls in this relaxing color-matchingadventure. This incredible shooter is simple and easy to learn,perfect for families to enjoy! Put your strategy skills to thetest! Compete against friends and family and see who can reach thehighest score and get 3 stars on every level. Earn coins while youplay and use them to get cool boosters. Use your logic and puzzlesolving skills to complete the fun missions and clear the board,and make sure to collect special daily bonuses. Download NOW theBest Bubble Breaker Game & Start Cracking Bubbles! Play theClassic Game Mode - So Simple, So Fun. Match 3 balls to blast andclear the board, complete the missions and win coins & awesomerewards. Tap on the screen to drag the laser aim and lift it totake a shot. It’s important to form a strategy according to thedifferent bubbles layout in each level. Shoot and pop all thecolored balls in this fun free game, aim carefully and hit thetarget! Work your way through all the different challenges andpuzzles, solve the brain teasers and win levels. Enjoy the ArcadeGame Mode – Never get bored! Pop the balls in this cool retro mode,and rediscover the classic arcade experience straight on yourAndroid device. Advance along thousands of fun puzzle levels asthis addicting game gets even more challenging. Enjoy the bestretro gaming experience anywhere and whenever you want, no internetconnection is required. Try the Puzzle Game Mode and Discover theUltimate Bubble Popping Fun! This shooter is a thrilling balloonpopper free app with thousands of challenging puzzles to master.Shoot the colorful balls to advance to the next amazing puzzlelevel, train your brain and test your matching skills while playingthis addictive, casual game for free. Hurry up and join the ballooncrushing mania, but be careful - once you start popping bubbles yousimply can’t stop! Retro game, new features We took the classicarcade game and added some new features that you’ll definitelylove. FUN FEATURES: ★ 3000 + Exciting levels, with more added allthe time. ★ New elements and great prizes. ★ Brand new effects andsounds. ★ Collect awesome daily rewards. ★ Connect to Facebook andshare the fun with friends! ★ Stay in the loop: now you have theoption to send a direct message to support. ★ Leaderboard,challenging achievements. ★ Clear obstacles and beat thechallenges. ★ Colorblind mode – so everyone can enjoy fun matchinggames for free. ★ Pop 7 bubbles in a row to unlock the fireball. ★Drop 10+ bubbles at once to get a bomb. ★ Play anytime andanywhere, no WiFi connection is required! What are you waiting for?Warm up your fingers and start popping. Experience this fun casualshooter and explore thousands of amazing levels filled with puzzlesand surprises. Get the best online color-matching app and enjoy asmooth and addicting gameplay. With so many exciting levels,powerful boosters and awesome features, you simply won’t put itdown! Get ready, take aim and shoot the balls!! Download and playthis fun arcade game for free. It’s the perfect app to play withoutwifi! Every 2-3 weeks, we add new features and new levels. Come andjoin the fun! Bubble Shooter™ is a completely free to play, butsome optional in-game items will require payment. Follow us forupdates and fun surprises! Visit our FB page:https://www.facebook.com/BubbleShooterOriginal/ All rights ofBubble Shooter™ are owned by Ilyon Dynamics Ltd.
🔥Classic Candy Bubble Shooter is a free game.🔥 It's a ancientpuzzle and Match-Three game. As a classic game, Candy Bubbleshooter is popular at all over the world. No matter women, child,elderly, housewives, handsome man, pretty girls love Candy BubbleShooter. Candy Bubble Shooter is a very funny and happy game. Playit with your family. We add 🌟🌟🌟🌟🌟🌟🌟🌟🌟🌟🌟🌟🌟🌟🌟 Let show it for you. 1.a super pet feed system. You can feed your own bird and dress upit. 2. 500+ funny and challenging game levels, Do you want tochallenge your brain? 3. More than 50 kinds of sweet candy bubbles.4. Fluent shooting experience. 5. Captivating arcade inspiredmusic. 6. Match 3 meets bubble burst. 7. More strategy and morehappy. What we bring to you? 1. Bring relax and happy to you. 2.Help you kill your boring time. 3. Help you train your brain andfinger. 4. Are you alone? We will be with you. Unlike word searchgame, Candy Bubble shooter is suitable for all countries and alllanguage. Candy Bubble Shooter is one of the best matching andpuzzle game! 🌟🌟🌟🌟🌟🌟🌟🌟🌟🌟🌟🌟🌟🌟 If your family have elderly, you wantthem to keep away from mahjong, card and other casino game or theywant find something to kill time. If your wife, childs or girlfriend always bother you. If your husband or boy friends alwayslive you alone. You can try to download bubble shooter. All youproblem will go away. Bubble Shooter Legend is an addictive bubble shooter game with 356+puzzles, join millions now in the best free bubble shooter gameever! 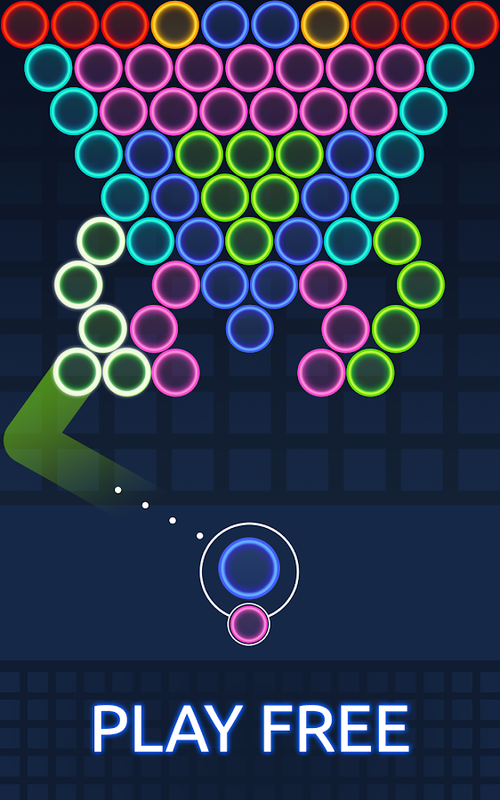 Bubble Shooter Legend is a classic bubble match 3 game. Pop,tap and tilt your way through over 356 addictive bubble puzzleswith excitement and packed with adventure! Features: - More than356 magic levels to complete! And more puzzles are coming soon. -Easy and fun to play, challenging to master - 4 Special Boostershelp you get high score. - Cute dragon pups boost your points. -Pop bubble with extension line. - Bubble pop with lightning bubble.How to Play bubble game: 1.Tap where you want to pop bubble 2.Togroup 3 or more bubbles to make them burst 3.Clear all the bubbleson the screen to level up,and try to get 3 stars on each level.4.Pop bubbles to save dragon pups as target in some levels.5.Bubble pop when hitting a fireball bubble. Tips: Breaking thebubbles continuously can get points as bonus! This free bubble gameis free to download and also good for family and kids. BubblesShooter game is completely free to play but some in-game items suchas extra moves or lives will require payment. Enjoy this FreeBubble Game! If you have any question or suggestion, please send usemail: [email protected] Thank you everyone who playedBubble Shooter! Bubble Shooter is our biggest game, with millions of downloads,always being polished, for your enjoyment! The game has 3 modes:Puzzle, Arcade and Classic. Puzzle mode: You need to clear thescreen, but pick your shots. Every number of shots the roof willdrop, making your job a bit harder. Arcade mode: The same goal asthe Puzzle mode, except the roof constantly approaches the bottom.Clear bubbles to pause the drop of the roof for a while. Classicmode: The original gameplay of Bubble Shooter games. Clear thebubbles in an endless run. Basics: You clear bubbles by matching 3or more of the same color. Mastering skill shots and using themwill help you through the tougher levels. Aim and Shoot with yourfinger. Beautiful and aesthetically pleasing graphics. Constantupdates and tweaks to keep your game experience fresh and fluid. Ifyou didn’t win, try again, you'll get it next time! Our games arefree to play, so if you enjoy this one, Please consider giving it a5 star rating and try our other games. The most cute bear of the history is coming! This is an epic game,exciting levels continuously. What is more, this bubble shootinggame for free! How to Play: - Aim and match bubbles where you wantto shoot the bubble. - To group 3 or more bubbles to make themburst. - Clear all the bubbles on the screen to get to a new level.- More than seven kinds of cute bear is waiting for you tounlock,you can invite five friends to unlock the special role. -Less moves you pass a level, higher score you'll get. - At the endof game,you will be awarded coins according to the score. thehigher score you got, the more coin will be awarded. - At the endof game,you can click the falling bubbles to get higher scoreFeatures: + easy operation but lots of fun. + Gorgeous specialeffects and beautiful images. + Different roles dress + Manyinteresting props to help you pass game quickly + A combination ofmultiple bubbles + No wifi can also play if you like bubbleshooting game,It is worth to try. Let's play it!